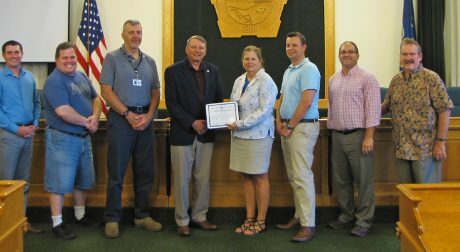 OSWEGO – The Oswego County Legislature’s Human Services Committee presented Sara Sunday with a certificate of appreciation for her 25 years of service to the county. Sunday is the director of the Oswego County Office for the Aging. Pictured from left are legislators Thomas Drumm, District 16; Daniel T. Farfaglia, District 24; Committee Vice Chairman Bradley Trudell, District 7; Committee Chairman Roy E. Reehil, District 5; Sunday; Tim Stahl, District 20; Nathan Emmons, District 15; and James Karasek, District 22.